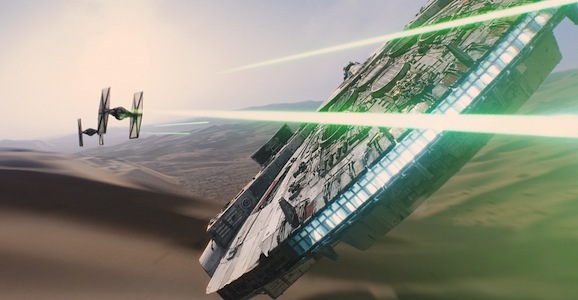 At this point, what would a day talking about sci-fi be without a potential spoiler for Star Wars: The Force Awakens? That would probably be a day we slept through, or maybe the day the internet finally breaks. But today is not that day, so there is the obligatory potential SPOILER, and it’s a doozy, like, maybe you don’t necessarily want to read this one. Seriously, there are SPOILERS beyond this point, like the kind we feel a little bit bad about posting. But you’re grownups and can make your own decision. One last time: SPOILERS. Okay, I feel like we’ve done our due diligence. This comes from Making Star Wars, who have been all over the Star Wars: The Force Awakens beat since damn near day one and who have broken a lot of stories. Granted, we don’t know if any of them are actually true (hell, J.J. Abrams recently said they’re still editing, so the picture isn’t even technically finished and there’s room for change), but what the hell, it’s fun to speculate and kick around what ifs. As always, this is unconfirmed, so take it with a grain of salt, or more, though they seem pretty solid in their belief in this report. Harrison Ford famously begged George Lucas to kill off Han Solo in the original trilogy, and one of the rumors floating around is that he gets his wish in The Force Awakens. The Making Star Wars report basically confirms this (again, make of this what you will), and also provides stunning additional details about the event, including who does it. According to the source, this was all filmed at Pinewood Studios. The scene takes place at a location they call “the Evil Castle.” Han is hiding, but decides to reveal himself to Kylo Ren, presumably played by Adam Driver, who we have also heard is Han’s son. As Rey (Daisy Ridley), Finn (John Boyega), Chewbacca, and the robot BB-8 watch in horror, Han steps out and Kylo Ren gives him the ending Ford always wanted for his character. Chewie goes bonkers and starts blasting, then stormtroopers file in, forcing everyone to flee. That’s a pretty damn traumatic moment, one that closely mirrors Obi-Wan Kenobi’s death from A New Hope. And if the rumors are true, and Ridley and Driver play Han’s kids, one child watching the other kill their father is going to leave one hell of a lingering scar. Given that this is the death of one of the most beloved characters in movie history, you have to imagine it will be handled in heroic fashion and that he’ll probably go out saving lives. Many people already expected him to die, but to do it in an offhand manner would be a slap in the face and a let down. Right now this is only a rumor, and we’ll obviously have to wait and see when Star Wars: The Force Awakens opens on December 18, but it seems to fit with other reports we’ve heard. Ford is also 72-years-old, and not quite the action star he used to be, so seeing him back for more movies after this wasn’t something many of us really anticipated. Do you believe this report? If it’s true, do you like the way they handle it? I hope it’s done better than the way Kirk died in Generations. Although it still makes me chuckle when I see it today years later, so maybe it wasn’t so bad. Hell Han needs to go out in a blaze of glory. I would like to see him crash the falcon into a deathstar or some big empire base. Yeah, it better be something momentous.